Happy Friday! We are in summer mode here at JMU, which means I have half days on Fridays from here until the end of August. Once the kids get out of school, those afternoons get gobbled up pretty quickly, so I'm hoping to savor the ones before that happens. Since it's Friday, I am again playing along with #Ask Away Friday. This week I am paired up with Shelly, the DIY Mama. Shelly and I had been scheduled once previously, but life go tin the way and we had to reschedule. I'm so glad we did because I had a great time snooping through her blog and learning more about her and her beautiful family. And she knows a ton about Disney!! 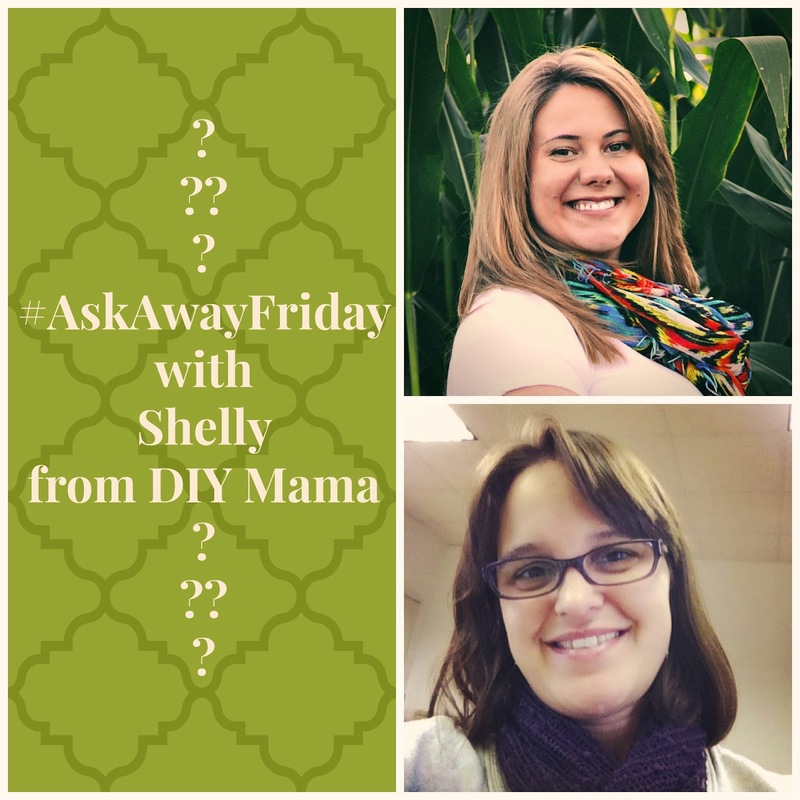 Make sure to head over to Shelly's blog DIY Mama to check her out and look for her answers to my questions. 1. I've seen that you do a lot of reviews for REALLY fun products like wine, chocolates and organizing systems (what blogger wouldn't love those things?!) How did you get into doing reviews (did they contact you or do you ever contact them?) When you started blogging to share memories, did you ever see yourself doing review posts? When I first started my blog I was really envious of some of the really popular blogs I saw that were always doing product reviews. It seemed like these women were getting new refrigerators and cars and going on really great vacations all for the sake of reviews. I've never had the idea that I would get to that point (but if you need your refrigerator reviewed, I'll help you out!) but I have enjoyed doing other reviews. I get reviews a few ways. One of them is through Tomoson.com. You sign up with your blog info and apply for different items you would be interested in. It took me a little while to get approved for something, but I've had almost 30 of them now and I have a few more coming. The wine and chocolates were part of the MOAM Mother's Day giveaway, so I was offered for being associated with the book. Recently I've also been contacted by some companies out of the blue. You've got to be careful about those to make sure they are legitimate reviews and not someone trying to scam your blog, though. 2. I remember watching your first vlog a few months ago and it inspired me to do my first Vlog! Your poor flowers were all dead b/c it was winter. Do your flowers still look like that? Any plans to plant new? My yard looks a lot better now! The grass and really grown tall and we've started a little vegetable garden in the front yard. We are trying to grow Brussels sprouts, broccoli, tomatoes, squash, zucchini, and green peppers. We don't always have the greatest luck, but I'm hoping we get something good out of the garden this year. 3. I have a daughter and I got teary eyed when I saw my Barbie's in excitement to share them with her! Do you have anything that you passed onto Frances that was yours or any traditions that you do with just your daughter? I didn't really play with Barbies much as a kid, so I don't know if I even have any to pass down to her. She did sleep in my childhood nightgown for a long time, though. I was really sad when she outgrew it. It's still on my dresser because I can't get rid of it, but I don't really know what to do with it. As for traditions, Frances likes to request girl-time. Usually that means sitting on the couch and reading books together. Sometimes we paint our nails together. She doesn't like me to comb her hair, but I used to have fun doing different kinds of braids for her. I'm looking forward to next year when I'll get to drive her to school alone. I'll have some good car time with her then. 4.I love your Tuesday Ten posts but I already have a few 'scheduled' posts through the week so I just read yours. ;) What's been your favorite TT subject? I love #TuesdayTen! 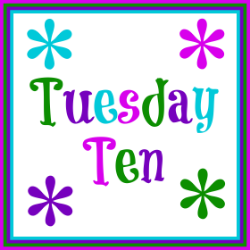 I had been making lists of ten on Tuesdays for a while and then Lisa of the Golden Spoons put out a request for a partner to create a linkup. I jumped on it and we've been going string since January. I like hearing everyone's take on the topic. Also, it doesn't have to be a list of ten or even a new post. You are welcome to link up an older post or something new that's related, but not a list. My favorites have been the ones that really give me a peek into people's lives. We did a "What's in Your Purse?" and a "What's in Your Car?" that were really popular. We have a "What's in Your Pantry/Fridge?" coming up. Who knows, maybe we'll do the whole house one room at a time! LOL! 5. On your bucket list you have a WIDE range of places to visit! What draws you to those places and will you be going to any of them in the near-ish future? I love looking at scenery pictures. I think most of those places are ones that I've been drawn to because of photographs that I've seen. I don't see any actual trips in the immediate future due to time and finances. Most of them might have to wait until retirement. 6. I visited VA for the first time last year for a wedding. Unfortunately, I only got to see Arlington. (We also saw Gettysburg and everything in DC which is why we weren't in VA much.) What is your favorite thing about VA that you'd want to show me? I love the Shenandoah Valley where we live! It has so much to look at and do throughout the year. If you came to visit we'd have a ton of choices depending on whether you are drawn to history, the outdoors, kid-centered fun, or fine dining. 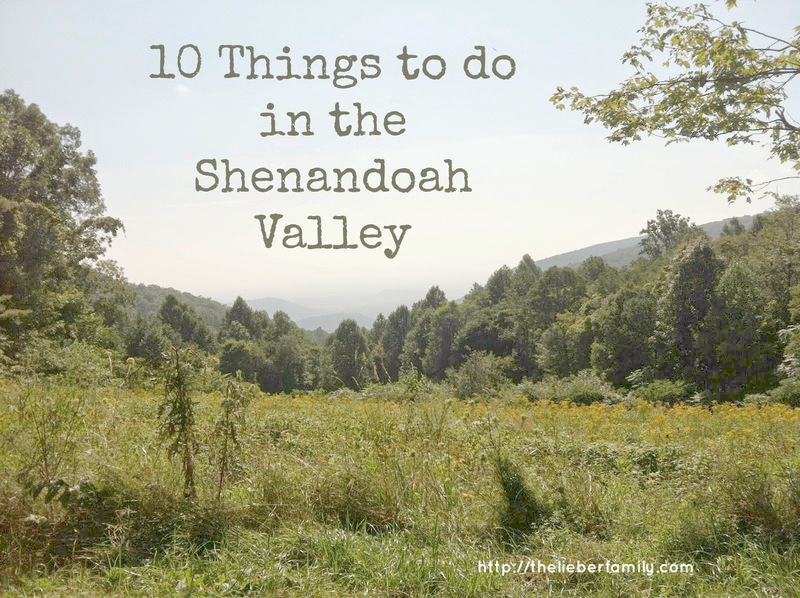 Check out this list for my 10 favorite things to do around here. 7.Does your family do anything fun for Memorial Day weekend? We don't really have any Memorial Day traditions. The kids and I will be off from work and school, but Ken will probably have to work. I'm hoping to lay low and simply enjoy the gift of a three day weekend. 8. What is your biggest fear? Where do you think it stems from? My biggest fear? Hmmm...There's not an answer that really jumps out at me. There are times I really worry about my kids' futures. Will they make good decisions? Stick with encouraging people? Be happy?? There are times that I worry that something will happen to me and the kids wouldn't have fun birthday homemade birthday shirts anymore. It seems silly when I type it out, but when I'm in the midst of those thoughts they can be a little bit overwhelming. I think those thoughts and worries stem from my realization that ultimately the future is out of my hands. I can make plans and try to be prepared, but ultimately it all comes down to factors beyond my control. 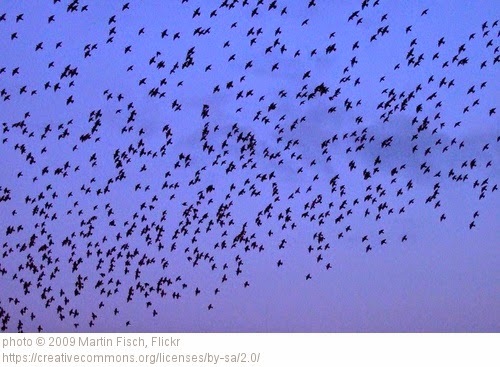 Oh, and flocks of birds. Those creep me out!! *shiver* I actually can't believe I just put that picture on my own blog! 9. 2007 is a LONG time to keep a blog up! Congrats! What do you think has kept you motivated to consistently write? My main motivation comes from keeping up with the memories for my kids and the friendships for me. I really enjoy blogging. I do it because it's fun. I suppose if it ever became a chore, I'd let it go, or at least cut back. Also, there's a bit of competitiveness involved. I've been on a pretty long streak and I don't want to break it!! 10. If you were to go on a vacation with a friend, (not anyone related to you) where would you go and why? My imaginary scenario goes something like this: I've won a free trip for three on a cruise. Julie, Stacey and I will pack up our bags, kiss our kids and hubbies goodbye and head on board. Once there, we'll kick back and enjoy some uninterrupted conversation, read some books, do a little sunbathing and relax in the sauna. I'm sure we'd swing by the massage tables at some point and also take the opportunity to go snorkeling together. I'm not even sure why I'd pick a cruise, as it's not something that's very high on my list, but it just seems like fun to be able to move around and visit places without having to pack up and travel in between. I mean, the boat's moving, but I'm not in charge of that. Bonus: Answer one question you asked me! "What's the oldest draft in your file and why haven't you finished it?" A while back I had this great idea come to me in a dream. The title was something like "Grammar Rules that Apply to Real Life." As I was in the shower that morning, I remembered part of it and actually used a tub crayon to write it out on the wall of the shower. But the more I thought about it, the more it slipped away from me. Lately, though, pieces of it seem to have been coming back to me. Hopefully I get it out eventually. Not to toot my own horn, but I've noticed that shortly after asking NJ and Lydia this question, they went back and finished the posts they brought up. Maybe that mojo will work for me too! I had a great time answering Shelly's questions. Make sure to head over to her blog and see her answers to the questions I asked. And now it's your turn: Which of these questions would you like to answer in the comments?